* Looking For The Aurelia II 2 Group Espresso Coffee Machine? 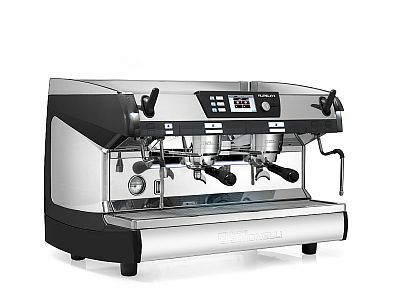 The one and only Aurelia II TFT Digital 2 Group Espresso Coffee Machine was the World Barista Championships official espresso machine from 2012 to 2014 for many good reasons. Dedicated to the high demands of professional baristas, the machine guarantees superb performance in all areas including flexibility, extraction quality, accuracy and consistent results. Featuring T3 technology, this new system sets new bars for temperature accuracy in water supply. The temperature of each group can be set by the barista, ensuring maximum flexibility in heat distribution using 3 different parameters (group, water and steam). Regardless of the environmental conditions or workload, the Aurelia II espresso coffee machine grants an unprecedented accuracy with temperature control. Control the water supply temperature of each group in real time right from the display. The great number of ergonomic features, including the evenly lit work surface, the angled back for the barista to check the coffee coming out of the spout and the LED lit steam nozzles to illuminate the interior of the milk jug are just a few of the reasons this espresso coffee machine is superior. On the Aurelia II espresso coffee machine, both the temperature and height of every single group is adjustable, allowing it to be suitable for any blend and use. There are three different versions of this machine available, the volumetric, semiautomatic and the competition and digit, each with many usual optionals available, this machine can suit every need. Easily regulate the pump without the need of a technician, along with the addition of the auto-steam wand, this machine allows every barista to create the thickest, most velvety milk cream every time.